....for being Fall fabulous with these numbers. It must be said how much I adore the pencil skirt - the silhouette, the versatility, the polish. If I died tomorrow (probably of a heart attack caused by over excitement about fall fashion), I would want to come back as a pencil skirt. Oh and my dog because he has the best life, but first and foremost a knee length, fitted, divine creation of the skirt variety. I felt the above choices were not only to die for, but displayed a sort of mantra for how one should approach fall fashion. A little jacquard (or tweed, I ain't mad at cha for either), a little print (it's not just for summer, ladies) and a lot of black jersey, black wool or any black fabric you deem appropriate to grace your derriere. And if the pencil skirt is the bee's knees, what pray tell should go with it? A silk blouse, a turtleneck, or a blazer and tee for starters - and then let your creativity run wild with a wool sweater or striped top if the mood strikes you. 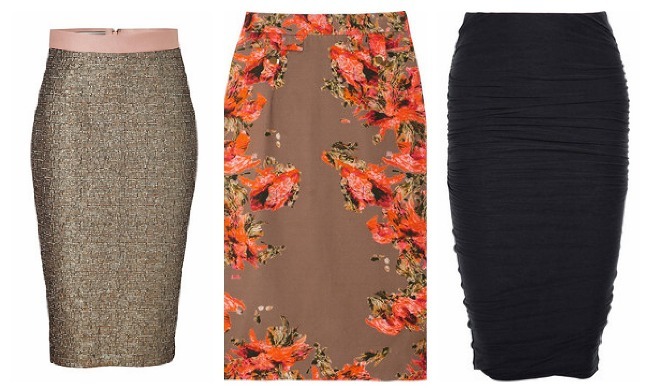 You (or I for that matter) can do no wrong in a pencil skirt - it's the equivalent of fashion immunity. Is there anything better? I think not. Yeah i have to agree..i love the pencil skirt....wear them quite a bit for work....The James Perse one above is gorgeous.